It's pomegranate time! 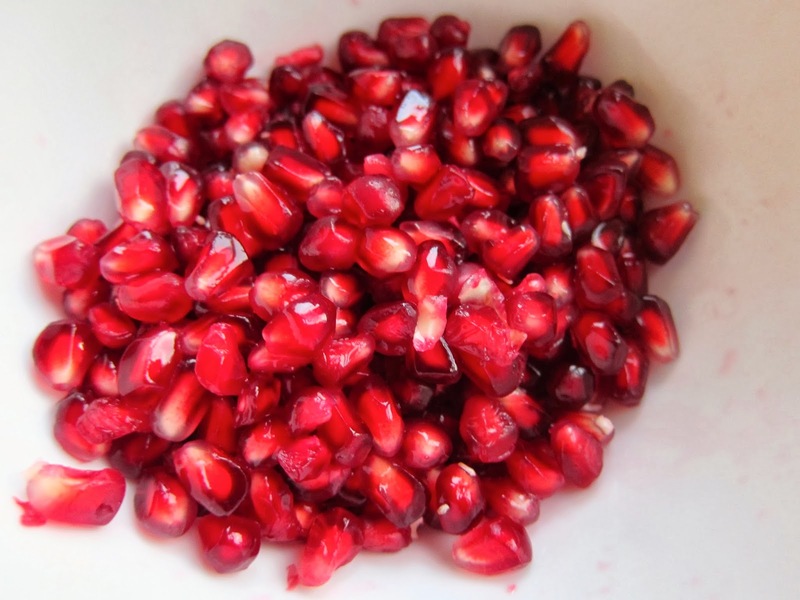 I love pomegranates. I don't know if it's the bright, garnet color that gets me, or the crunch and pop of each pomegranate seed, or just the delicious sweet and acidic flavor that comes from it - but whatever it is, I know I think they are a superb fruit. Pomegranates are generally in season from September to February - thank god, considering most produce in the winter time is kind of boring....besides all the citrus fruits. Regardless, I generally cannot resist pomegranates, and today was definitely one of those days. But I wanted to do something a little different with it, and make it a bit more savory than usual. 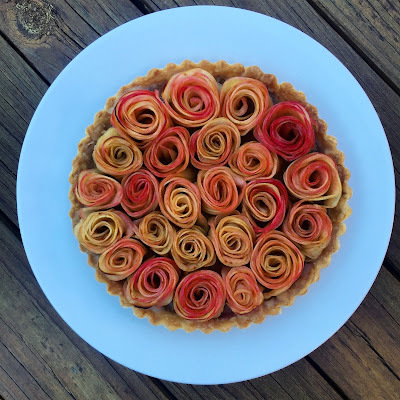 It's easy to toss the seeds in a salad, or do something with it raw, but I took a different route. 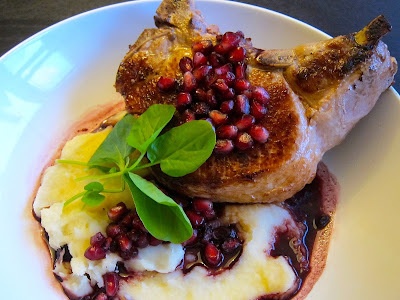 Pork generally pairs very well with dark fruits, so why not pomegranate? Turns out, it's a match made in heaven. 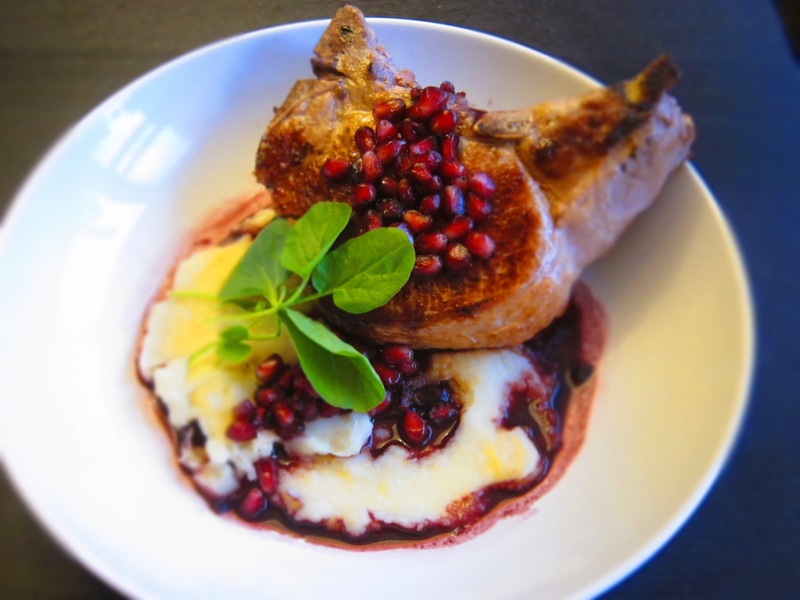 A thick-cut, center-cut pork chop is pan-seared, and a pan sauce is made with red wine and the pomegranate seeds. 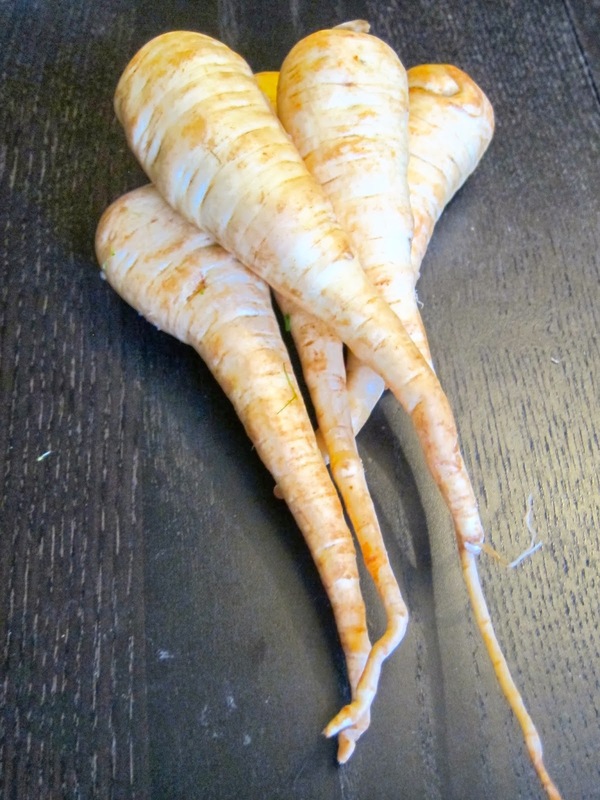 Served with a parsnip puree (that is almost over-bayed, but not! ), it's a dish guaranteed to make most everyone happy! Sidebar: Everyone has a genius way to take the seeds out of pomegranate. A lot of people cut the pom in half and slam it down to loosen the seeds. I think that is just plain MESSY! My route is to cut it in half, and just gently pull the seeds out by basically peeling away the membrane and skin. Much easier, and much less messy. You're also sure to get ALL the seeds! First, generously salt and pepper both sides of each pork chop and let come to almost room temperature. Bring a large sauce pot of salted water to a boil, and add in the bay leaves (break them each in half). When the water is boiling, gently pour in the parsnip pieces and bring back to a boil. Cook until fork-tender, about 10 minutes or so (depending on the size of the chop - test occasionally!). When finished, drain the parsnips (reserve about 1/2 cup of the cooking leaves), remove the bay leaves, and mash or puree in a blender. Use the reserved cooking liquid to create a smooth texture. Season to taste. 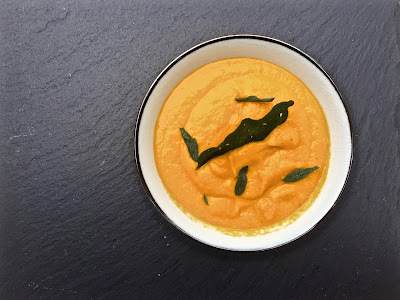 The puree should have a nice bay-leaf flavor (not over-bayed!). While the parsnips are cooking, heat up a sauté pan over medium-high heat and swirl in ~2 T of olive oil. When the oil is hot, place the pork chops in the pan and cook until that side is golden brown and has formed a nice crust, about 3-4 minutes. Flip and sear the other side as well. Cover the pan while this side is cooking to allow the pork to come to a nice medium, medium-rare, another 4 minutes. Remove from the pan and let rest. Check the inside to ensure it's just cooked through, but not overcooked! Cooking time does depend on the thickness of the chop. With the pan still over heat, pour in the dry red wine and bring to a boil, scraping up all the browned bits on the bottom of the pan. When the wine starts to boil, toss the pomegranate seeds in the red wine and stir. Let cook until the seeds are just warmed through and the wine has reduced, about 1-2 minutes. Remove from heat and get ready to plate! To plate, spread a few large spoonfuls of the parsnip puree on the bottom of the plate. Rest a pork chop on each, and drizzle the pomegranate pan-sauce over both chops. Finish with a few leaves of upland watercress and a crack of fresh black pepper. The flavors in this dish are awesome! 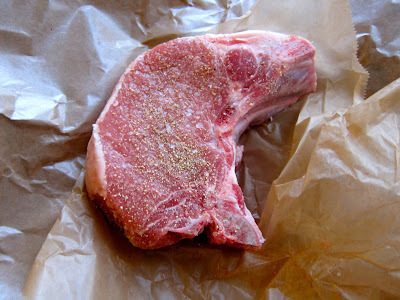 The crust on the pork chop seals in the juices (thanks Maillard! ), and gives a nice crunch to each bite. The parsnip puree adds a nice acidity (yup, from the bay leaf!) and lightness to the dish. The pomegranate, red-wine pan sauce pairs perfectly with the pork and parsnip combination, while the watercress adds a nice pepper flavor overall. All together, one fine dish, and great for this cold weather! I never knew that such good meal could also made with the help of a fruit and pomegranate is already one of my favorite fruit.